Letters From A Tapehead: Nomeansno: "Dance of the Headless Bourgeoisie"
Nomeansno: "Dance of the Headless Bourgeoisie"
Southern Records has been on a reissue tear over the last two or three years, pushing out classics from Crass (in conjunction with Crass Records), Rudimentary Peni and Nomeansno. 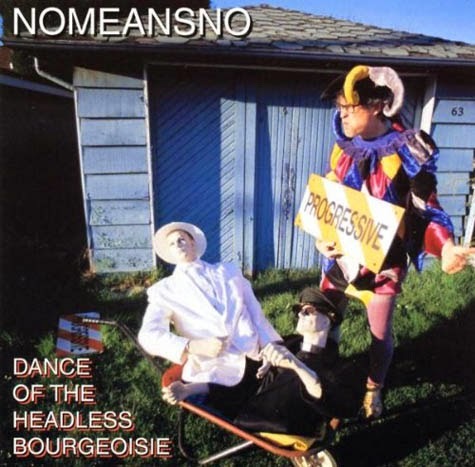 April 28th will see the reemergence of Nomeansno's Dance of the Headless Bourgeoisie, which originally released by Alternative Tentacles in 1998. The social commentary is still biting, wildly pronounced by Nomeansno's brand of sardonic candor and propulsive funk. Post 9/11 it's hard to imagine the terrorist bent of the title track flying nowadays without prompting some kind of response from the "persecuted" wealthy in the U.S., but there's safety in obscurity I guess. Information on the reissue arrived courtesy of Rarely Unable. Originally released in 1998 on double LP and CD by Alternative Tentacles, Dance Of The Headless Bourgeoisie was reissued on CD on the band’s own Wrong Records in 2004, but it’s taken them a while to get around to a vinyl reissue. Now Nomeansno fans the world over ﬁnally have the chance to enjoy the album in its full gatefold glory. The tenth album from Nomeansno was, and still is, a groundbreaking exploration of social and political lyrical statements and post-punk musical workouts. Back in the day, confused people liked to call this “jazz-punk” or “jazzcore” because it involved more than three chords, time changes and slow parts. It still sounds like nothing else, comfortably in a league of its own, chock-full of both celebratory and angry sounds, with a smart lyrical lurch, and enough sharp musical turns to cause severe dizziness. Released in conjunction with Southern Records, Dance Of The Headless Bourgeoisie will get the double 180-gram vinyl gatefold treatment with an mp3 download card included.